Standing Guard | Daddy's in Charge? In case you didn't know, my wife and I decided to take the kids to Quebec City. One of the main tourist attractions is The Citadel. 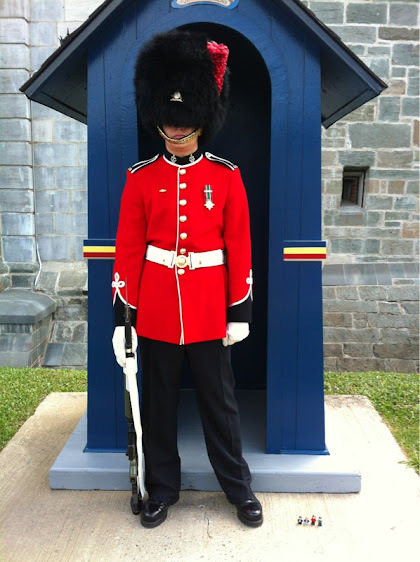 Outside the Citadel guards stand watch 24 hours a day. Their main objective it seems is to not move or show any expression while tourists try to make them laugh. It's not as easy as it sounds as people will do anything to try and make them let their guard down. I don't know what it would take to make these guys move, we tried really hard. But this guy changes his expression less than I do. Maybe we should have stood a little closer? Perhaps a good knock knock joke next time. maybe he couldn't hear you under that hat. Actually, that guy looks like a teenager wearing his father's uniform trying to prove he's a man. That guy has very poor posture! I thought they would have to stand straight up. They all lean that way... I think they need to do that to hold onto the gun. I bet he was asleep. Could have been... Might as well. He's not doing anything else. I think he looks terror-stricken, sort of trying not to run. Who were the Lego guys, John, you're family? I guess I should have been more clear about my Lego family visiting Canada, huh?